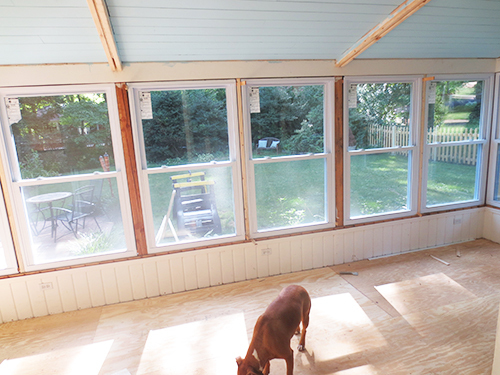 I don’t have any more house-related posts this week as we’ve halted sun room progress to host Mark’s dad this weekend. We actually have lots of guests slated to pay us a visit in the next few weeks which has got me thinking about what to cook. Since Labor Day weekend is often a time for lots o’ food, I thought I would share with y’all my favorite recipes. I tried to cover a variety of recipe types, entrees, breakfast, etc. so hopefully you’ll find something here that works for your plans this weekend. Giada De Laurentiis’ White Bean Dip – Similar to hummus, this is easy to make and always is a hit at parties. Serve with either homemade or store-bought pita chips, and/or a selection of sliced veggies. Paula Deen’s Tomato Basil Bread Pudding – This is not a typical Paula Deen recipe, but it appeared in her magazine a few years back and every time I do a brunch party, I make it. In fact it’s on the menu for this weekend. Bob Blumer, The Surreal Gourmet’s Blackened Home Fry Potatoes from Hell – Back in the early 2000’s when I was first learning to cook and also use the Internet, I found this recipe on foodtv.com. These take a while to make, but are so, so good. They’ve become a staple on Christmas morning. Nestle Tollhouse Oatmeal Chocolate Chip Cookies – There’s a million chocolate chip cookie recipes out there, but the one on the back of the yellow bag with oatmeal is my favorite. You can never go wrong with a chocolate chip cookie. Lesley’s Famous Chicken Chili – My best friend in the world is also a trained chef. Her blog of recipes is amazing, but this is the one I make the most. Perfect for football Saturdays, winter Sundays, and every day you’re in the mood for comfort food. Barefoot Contessa Asian Grilled Salmon – This one is perfect for a romantic dinner for two or a dinner party (if you can swing the cost of salmon.) The marinade/sauce is so easy and so delicious and it you can make this in less than 30 minutes. If you don’t have access to a grill or grill pan, you can just pan-sear. Serve this with my asparagus recipe below and some brown rice. Pioneer Woman’s Spicy Dr. Pepper Shredded Pork – This is a crowd pleaser. Again super simple ingredients and amazing flavor. You can serve this with tortillas or rolls to make tacos/sandwiches or with sides like corn pudding, cole slaw, baked beans, mac n cheese, etc. “Mom’s” Potato Salad – This recipe is from my great-grandmother on my mom’s side whom everyone called “Mom.” I come from a long line of great cooks and to me, Mom’s potato salad is the best there is. It’s not fancy, the key is the salt. If you get the salt right, people will fall in love with this potato salad. Gerald Colapinto’s Linguine with Pancetta and Sauteed Cherry Tomatoes – My mom gave me this recipe awhile back and while I don’t make pasta too often, this is the recipe I reach for when I do. If you’re lucky enough to live by a Trader Joe’s that sells the pre-chopped pancetta, use it. If not, and if you can’t find pancetta at all, just use diced bacon. Barefoot Contessa Frozen Key Lime Pie – Mark and I went to Key West a few years ago and loved it, but we didn’t find any key lime pie down there that was better than this one. Emeril Lagasse’s Pineapple Habanero Chutney – I originally found this recipe when looking for a recipe for coconut shrimp and it’s delicious with that, but is also amazing on fish, pork and chicken as well. If you (and your guests) can handle the heat, this stuff is so versatile that having some in your freezer at all times will guarantee an amazing meal is always just around the corner. Kate’s Asparagus – I invented this recipe myself when I first started cooking and it has been a stand-by ever since. If you’re making this in bulk, use a garlic-infused olive oil to get a similar result with less effort. I know I have four BC recipes on here, but for “fool-proof” stand-by recipes, she’s the best. Seriously, I could list like another 10 of her recipes that I love. I literally taught myself to cook by watching her show and even before I knew what I was doing in the kitchen, I could follow one of her recipes and make an edible meal. For folks who aren’t confident cooks, try a Barefoot Contessa recipe. Although sometimes her ingredients are a little pricey, the end result is always delicious and if you’re cooking for an important/special occasion, isn’t the extra cash worth the peace of mind? Okay, that’s my list. Please feel free to share your favorite “go-to” recipes in the comments, I am always looking for new things to cook! Do You Know About The Dog Trot? No, this isn’t a post about a new dance move. I think twerking is still terrifying most of us well into Wednesday. A dog trot is a little known house style that I happen to be in love with. The first time I was ever in a dog trot style house was in Hawaii when I was working a catering gig at a private home in Honolulu. The house had a large entry that opened onto a long, wide hallway that looked all the way through to the lanai out back and the ocean beyond. To the left and right of the large hallway, were the kitchen, dining room, bathroom and office. A set of stairs led to the bedrooms. Because this house was water front, I loved that you could see the ocean from the moment you walked in the house. Many people don’t know that despite it’s mainly tropical environment, many homes in Hawaii don’t have central AC. Smart architects and builders have for years built homes that make good use of Hawaii’s signature trade winds to cool a house naturally. It turns out that folks in the south did the same in years before electricity and air conditioning and homes with this style there were referred to as “dog trots” because you would often find the family dog laying in the hallway where it was cool. A couple of years ago Southern Living featured a dog trot in style house in South Carolina and that’s when I first learned the term. To me this house is everything, and ever since I read that article I have been obsessed with one day building a similar house. 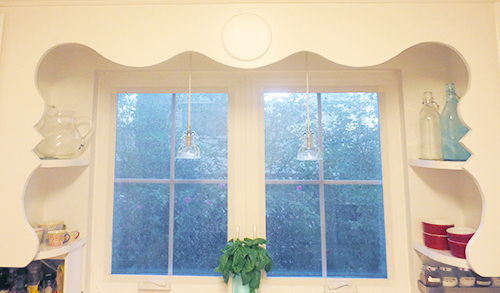 Today on Hooked on Houses, Julia featured a kitchen redo in East Texas from Kim who blogs at Living Vintage. I love what’s she’s done to her 1800’s dog trot, don’t you? Anyway, it inspired me to share with you my version of the dog trot. Who knows what the future will bring, but in my dreams it brings me this. The house is about 2,500 sq. ft. but since it’s all on one level and there’s only two bathrooms and two floor types, I think it’s an “easy 2,500 sq. ft.” Here’s an aerial 2D shot. 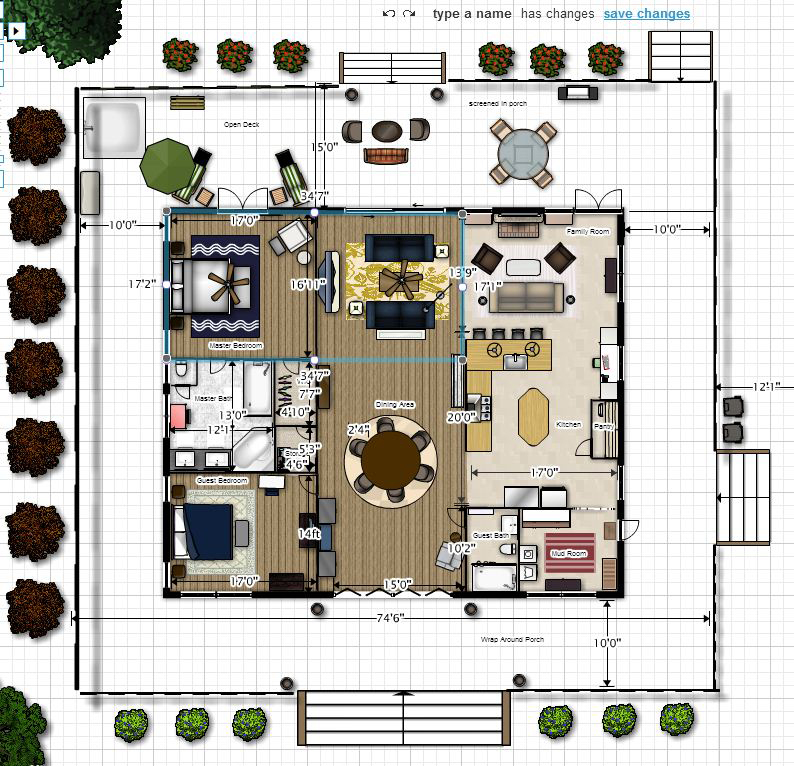 I created this “dream” in floor planner and as you can hopefully see, a set of stairs leads to a wrap around porch and the front entry which is two, large bi-fold doors. A circular dining table in the center hall acts as both a formal dining room and a great place to play cards or sit with a visiting neighbor. Behind it, on the way to the back porch is a sitting area with a fireplace. The right hand side of the house is where you’ll find the guest bath/powder room, a mud room that leads to the side porch and the garage, as well the kitchen and main living room. This entire “side” would be tiled for less wear and tear and easy maintenance. The rest of the house would be hardwood. 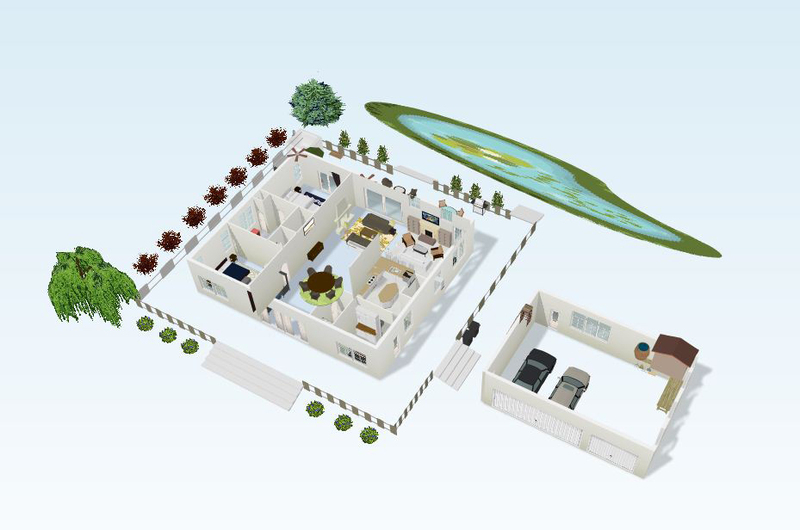 The left hand side of the house contains the two bedrooms separated by the master bath and walk-in closet. Each bedroom is good-sized and the master bath features a separate tub and shower and double sinks. 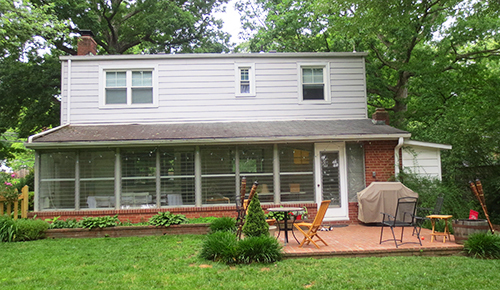 The back patio features a screened in eating area as well a lounge area and hot tub. Are you ready to move in? In the current world of “open concept” obsession, I wish more people would consider this style. While many of the ones you see are more traditional, I have seen some modern interpretations as well. Here’s a link to many different versions. Have you ever seen a dog trot house? Do you love them? If not, what style blows your skirt up? There’s so many to choose from! 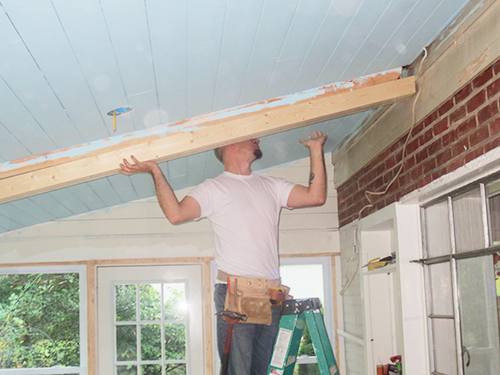 We’ve trimmed out the ceiling beams. Remember these guys? We covered how we installed them here. 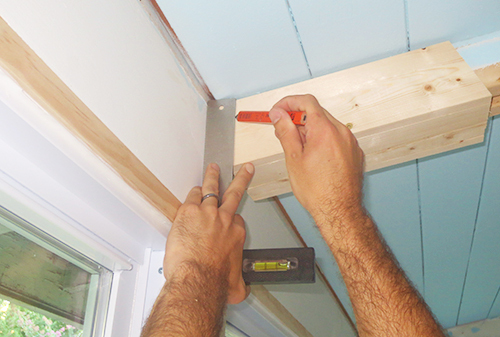 We used (2) 2 x 8s attached together with a piece of particle board between them to create a beam that is 3.5″ wide. Because, of course, a 2″ x 8″ is really 1.5″ x 7.25″. Here’s a close up of the beam. 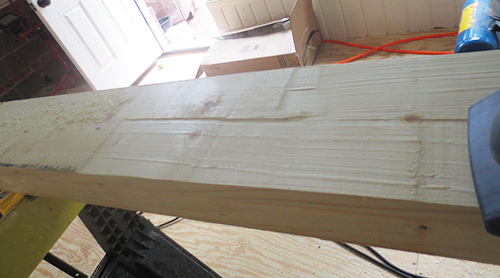 We specifically created a beam that was 3.5″ wide, so that we could use 1″ x 4″ pieces of pine to create the trim piece. 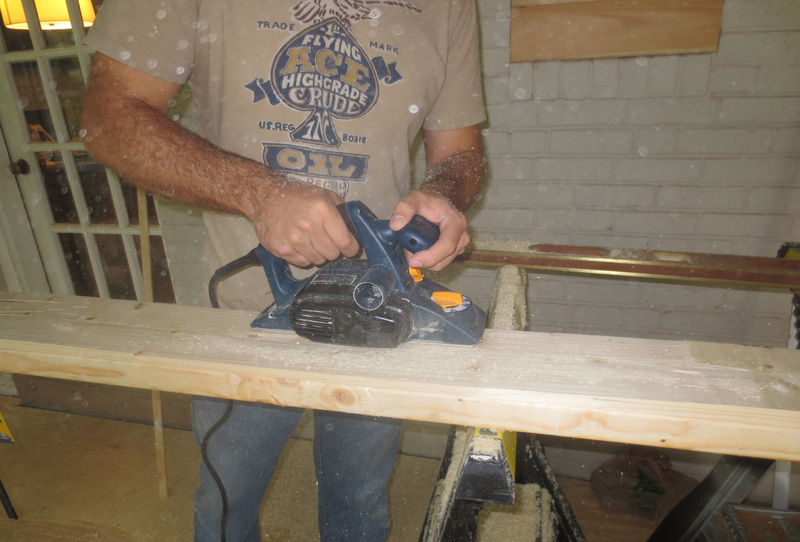 In order to get the angles right on the trim, Mark created a template. He then took the template and wrapped it around the beam where it hits the wall. Then he took a straight edge so that he could mark the correct angle on the template. 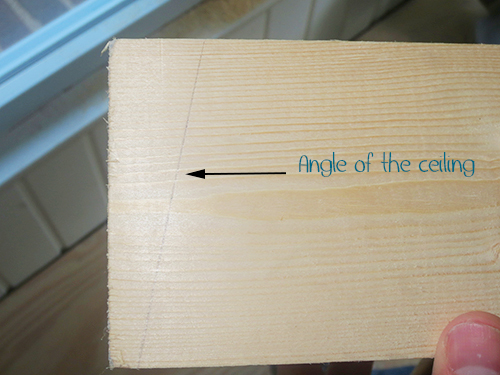 Then he took the template with the angle marked on it over to his mitre saw in order to determine the degree of the angle. 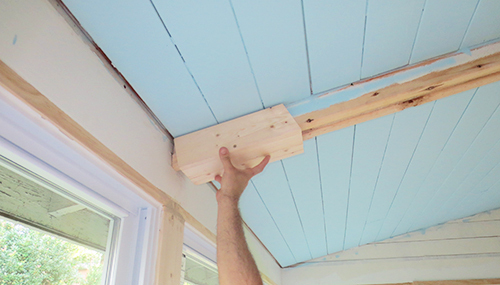 Now that he knows exactly what the angle of the ceiling is, he can assemble the trim piece by screwing together three pieces of 12′ long 1″ x 4″. Then he cut the angle of one end of the trim piece and then measured to see where to cut the other end. Once the end angles were cut, Mark slid the piece over the beam on the high side of the ceiling, and then walked it down to the other end, pushing it over the beam as he went. 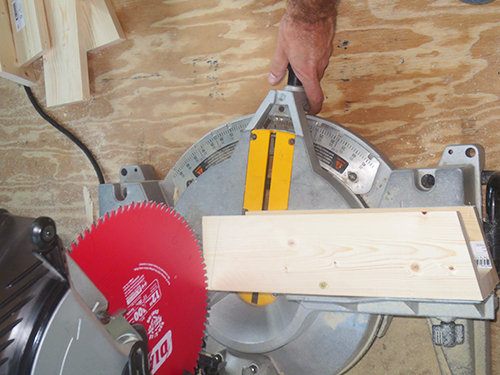 Once the trim piece was in place, Mark secured it with decking screws every couple of feet. 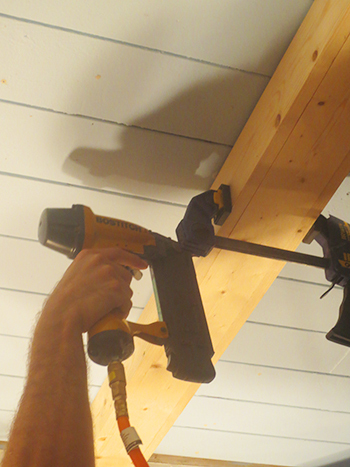 Then, in order to minimize the seams as much as possible, he used a clamp to compress the trim piece around the beam and then used his nail gun to drive a few nails through the trim piece into the beam. Sorry about the light and shadows in the picture above, it was getting late and we were trying to finish. This morning when the light in that room was better, I took these pictures of all the beams with their trim. Again, here’s the before without the trim. In addition to trimming the beams, we have also started sanding all the rest of the trim pieces around the windows and doors. 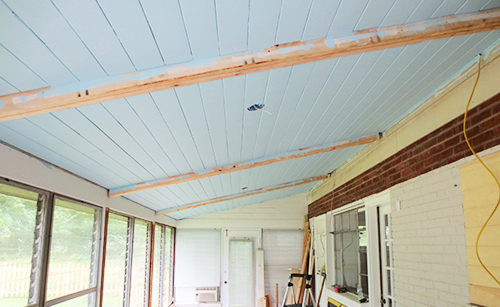 Sanding is such a pain, but it’s often what separates a project from looking pro vs. DIY. Sand people, it’s worth it. 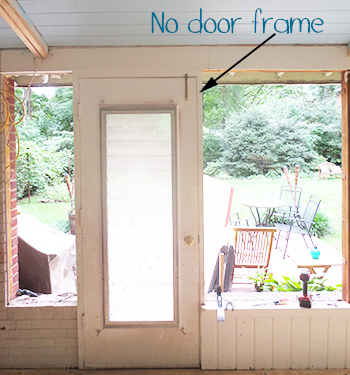 Remember when I told you that we had to install new doors in the sun room a little earlier than planned? Well as Mark was leaving for Home Depot to buy said doors, I asked if he needed me to come along. He said no because we had already discussed what door we were going to buy. A few minutes later my cell phone rang and it was Mark. He was in the hardware aisle because apparently (and this is a real pro tip, you guys) when you buy a door, you also need to buy a door knob. I’ll wait a minute while you let this sink in. So while we had discussed the type of door we wanted, we had not considered AT ALL what type of door knob. Don’t be like us. You’d think that even though we hadn’t thought the knob through, this wouldn’t be a big deal because obviously we have other door knobs in the house, so we would obviously just get the same kind as we have elsewhere. Done and done. Well here’s the thing. While the other door knobs in the house are all the same shape (round knobs) they are not all the same finish. There’s that sad trombone again. 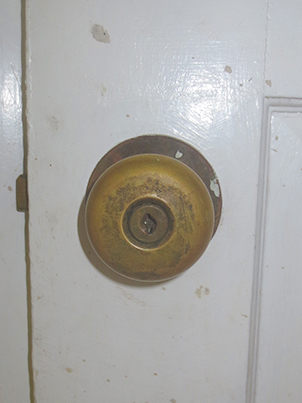 Some of the door knobs are brass, however the ones on the kitchen and bathrooms are bright shiny chrome. I would guess that originally the brass ones were bright and shiny as well, but over the years they have developed a patina from use so they are now pretty much each their own color. Here are a few examples. This is the inside of the front door. 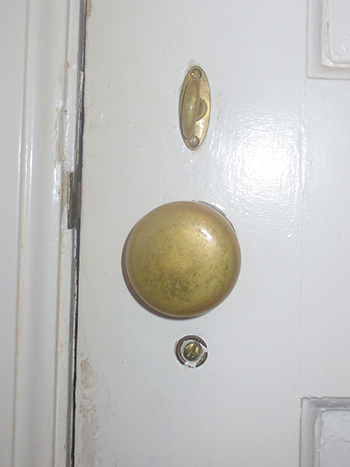 This knob is still pretty brassy because if the people who lived here before us were anything like us, they didn’t use the front door very much. This one is a bit more weathered. 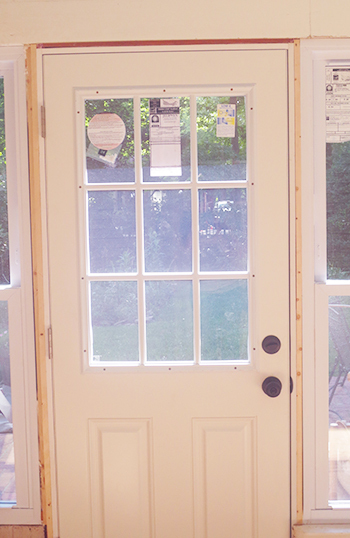 This is the door that takes you from the sun room into the living room and dining room. And this is the door that takes you from the sun room into the kitchen. Also a nice patina, no? So it’s settled then, we’ll go with a hand worn brass 1948 knob! They don’t sell those? Really? Well what’s the next best thing? Wow. Do you have anything a little less brass? Okay, that’s ok. But in person since they are new, they don’t really match as well as one would hope. *Sigh. Decisions like this are hard for me. I actually tend to be a little “matchy-matchy” so it bothers me when things don’t exactly match. My theory is that if they aren’t doing to be a complete match, I don’t want them to be close. I would rather go a different direction entirely. And that’s how I wound up eyeing this guy. Although we don’t have any other oil rubbed bronze door knobs in the house, we do have a couple of lights/lamps with that finish in the living/dining room and we anticipate that we will have some in the sun room as well. 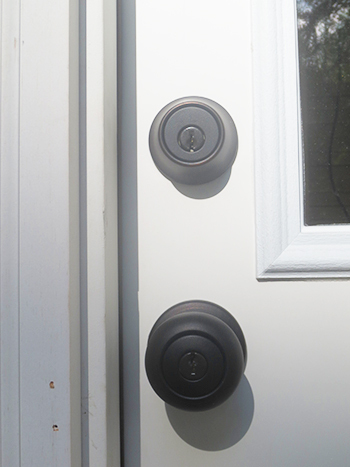 So, after more thought than one should really put into this type of decision, we decided to go with oil rubbed bronze knobs on the two new sun room doors. Here’s what they look like up close. And here’s what they look like on the whole door. 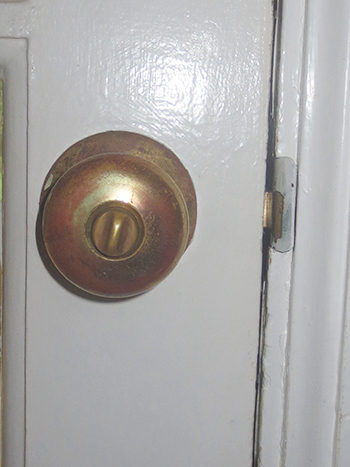 So as the title of this post implies, the full range of door knobs in our house is anything but “matchy-matchy.” At least all of the knobs are the same rounded style. We actually like that the variance in metal tones conveys the age and “character” of the house. Perhaps before we try and sell it we will look into trying to unify the knobs, but for now our mis-mash suits us just fine. And I am glad to have that big decision behind me! Hope you have a good weekend you guys. We’ll be in the sun room trimming and sanding. Feel free to stop by! It was pretty exciting around here when the new windows went in. There was jumping up and down and clapping. And that was from Mark. 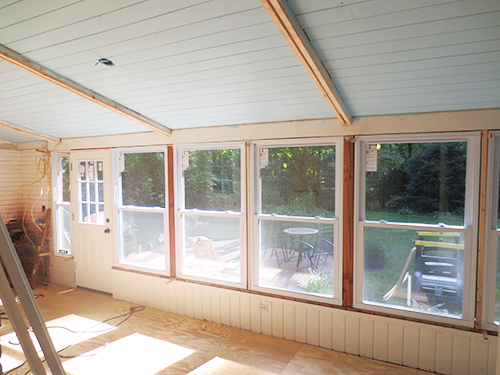 It wasn’t until a couple of days later that, while in the backyard playing with the dogs, I looked back at the sun room and realized the transformation the windows made to the outside view as well. 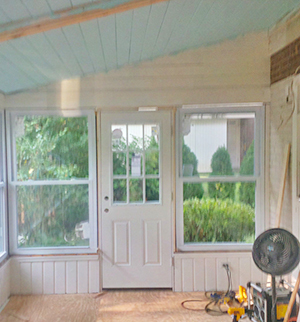 Here’s what the sun room looked like from the yard before we started the reno. And here’s the same view now. Is it just me or does the whole house seem bigger? To me the more substantial footprint of the double hung windows makes the lower floor seem much larger. I also think that it no longer looks like an add-on from the outside. *Winning! I know this isn’t much of a post, but the difference was so dramatic to me, I had to call attention to it. If you can’t see it through your computer screen, come visit and I’ll show you in person! 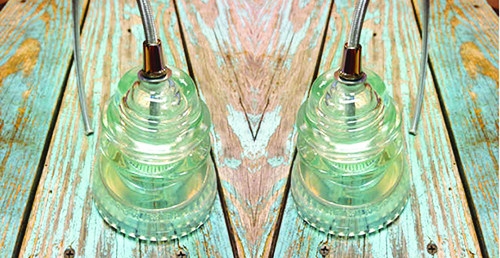 These are glass insulator pendants lamps. And no, you can’t have mine. I saw them on Pinterest, of course, and found a nice man in North Carolina who makes them. His Etsy shop is called Luce Antica and he makes these pendant lamps along with many other cool lighting products. 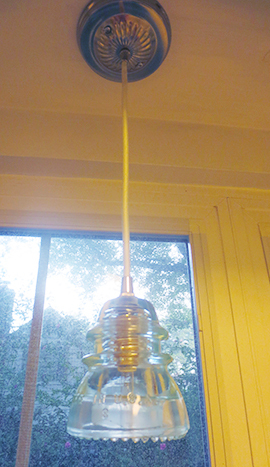 When I first saw the picture of one of these lights on Pinterest, I didn’t know what a glass insulator was. All you smarties out there can shake your head while I explain to the rest of you that a glass insulator is a type of electrical insulator, which is a material whose internal electric charges do not flow freely, therefore it does not conduct an electric current. Insulators are used in electrical equipment to support and separate electrical conductors without allowing current through themselves. A glass insulator attaches electric power distribution or transmission lines to utility poles and transmission towers. Tom lists his glass insulator pendants for $65.99 each. I “splurged” on the highest quality light bulb because these are going above my sink which is currently really poorly lit and I wanted it to be bright over there. No more missing spots when doing the dishes! The total cost for (2) ice blue Hemingway 42 insulators with white cloth covered cords, chrome canopy and strain reliefs, and (2) 40W krypton bulbs was just about $150 with $17 shipping. I thought this was a fantastic deal as most pendants you see from large retailers are $80 and higher (sometimes much higher!) And most of those are not even made in the good ol’ U-S-of-A with recycled parts. Here’s what they look like hanging in my kitchen. They are a little hard to see through the window, but that’s really why I like them. They are light and airy and a perfect fit in the space. I really thought I needed two pendants in here because I wanted them to hang in front of the window and if I only had one, it would hang between two, where the basil is in the picture above. But many of the options I found would have been too large to have two of them (not to mention expensive), so I am so thrilled to have found these. And I am glad that I went with the highest watt bulb, it’s so much brighter in the kitchen now and I love that when I am cooking and cleaning at night. Here’a shot with the light on. And, for all those real detail orientated people, here’s a shot looking up at the ceiling where they are installed. 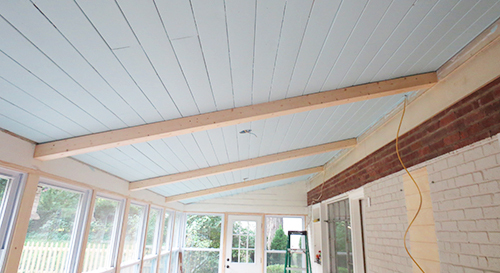 You can choose the finish of the canopy and strain reliefs as well as the type/color of the cord. Tom also has some insulators that a clear as well as a dark blue. If you don’t see what you are looking for on his Etsy shop, just email him, he’s great to work with and is happy to do custom orders. 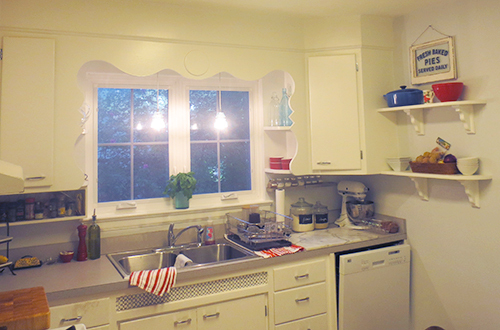 I am so pleased with this little kitchen upgrade. It was truly a great birthday present. Update: We’re still in love with our new windows. Okay, moving on. 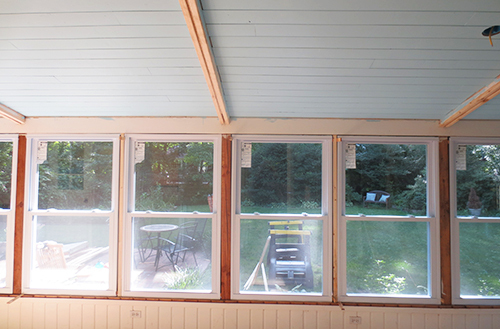 This past weekend was spent starting to install wood trim around each of the windows. There’s a lot to trim, y’all. As a metaphor, trim is kinda like a snazzy rain coat. It hides whatever messy-ness you have going on under neath and keeps you dry. 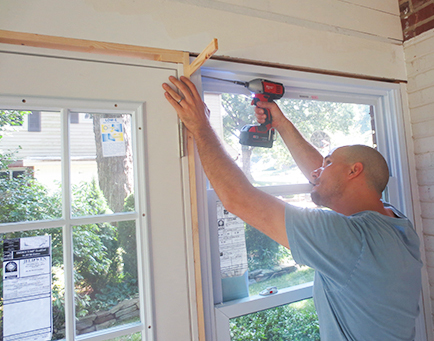 You caulk the windows, of course, but the trim makes everything seamless and lovely. 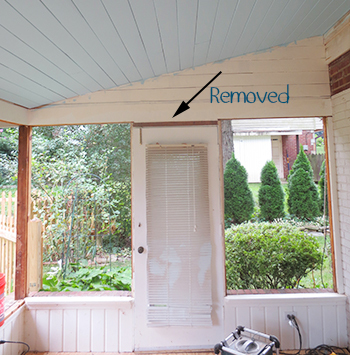 Here’s where we started on the long run on windows before we started to add trim. And now with some trim. Besides there being alot to trim, there was also an issue with getting a wood piece that would cover the larger 4×4″ posts that run every few windows. They don’t sell a board 4″ wide in the thickness we needed at Home Depot so Mark borrowed a plane saw from our neighbor and planed down a thicker board that was the right width. 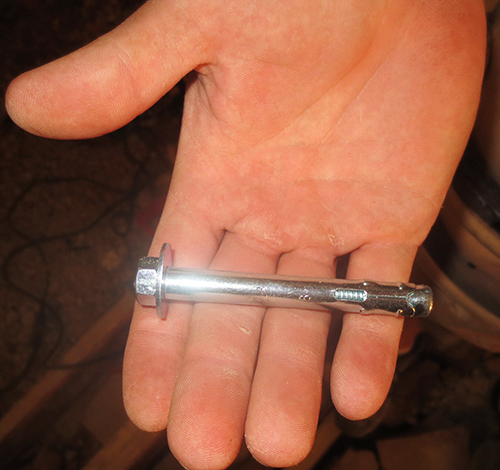 While we were grateful that our neighbor had this handy tool, the job was still messy, time-consuming, challenging, and loud. 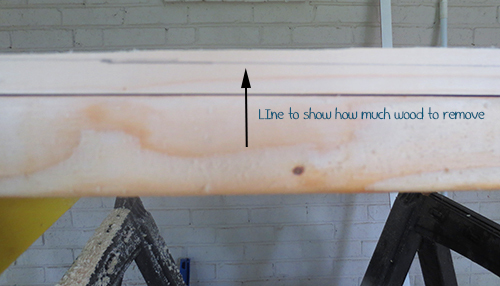 To do this, Mark drew a line on the wood that designated how much he needed to remove to achieve the right thickness. 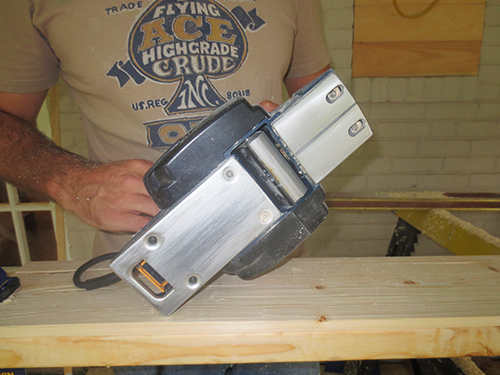 This is what the bottom of the planer saw looks like. Basically it works like a cheese slicer to shave off a thin slice of wood. Here is a shot of Mark using it. As I mentioned, it’s very loud and creates alot of sawdust, but it did get the job done. So that’s where we’re at currently, working through all the trim. It will likely take another week and a half to two weeks to get everything done. The good news is rather than post boring trim updates for the next two weeks, I’ve got a couple other posts in the hopper. We have some new kitchen lights I am excited to share with you and I’ve got at least 200 words on door knobs I know you are dying to read, so get excited for that. They’re In and They’re Spectacular! Woot Woot! Our new windows are installed. Also, our new doors, more on that in a minute. 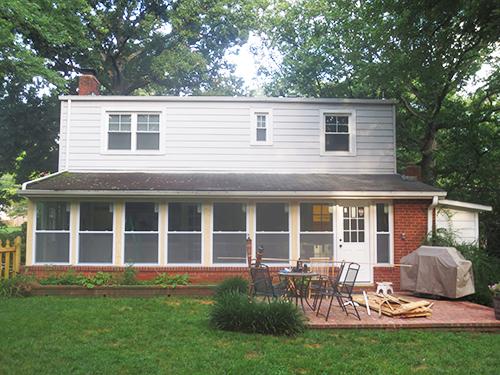 We knew that the difference between the 20+-year-old jalousie pane windows we had before and our new bright white vinyl double hung windows was going to be night and day and boy were we right! 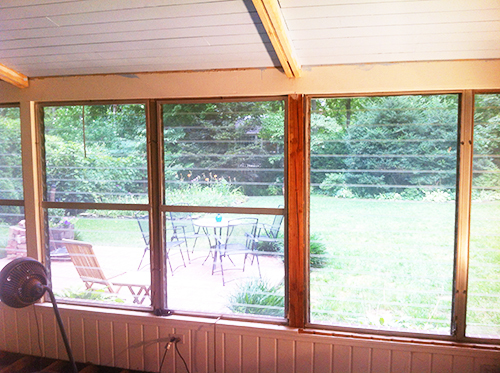 Here’s what the view looked like from the sun room into the yard with the old windows. And here’s what it looks like now. 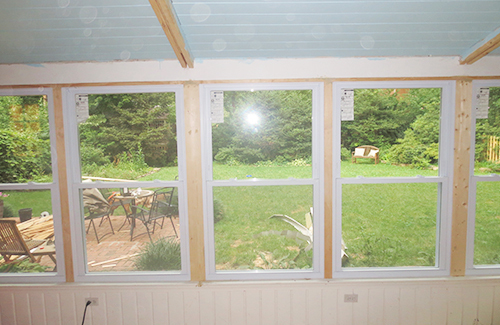 I’ve got more pretty “after” pictures to show you but before I do, how about a little “how it happened?” To take the panes out Mark cranked the windows open so that the panes were not touching one another. Then he carefully pried each pane out of its holding clip. 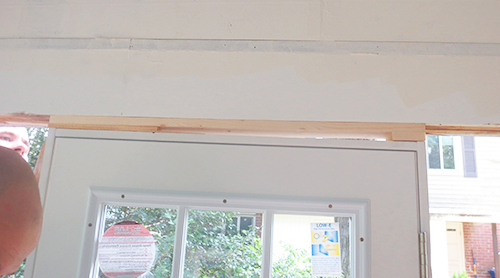 To remove the frames, Mark used a pry bar and pried the frames away from the header beam on top and away from the posts on the side. Then he just pulled them out. 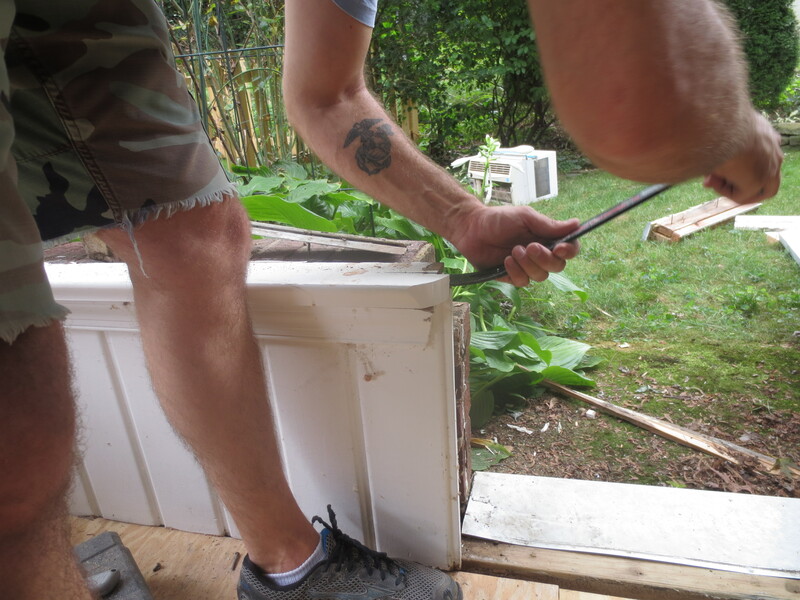 We were originally going to give the windows to a friend to use in a green house, but the mechanics of the windows were held together by cheap/old rivet joints that came apart during the pane removal. 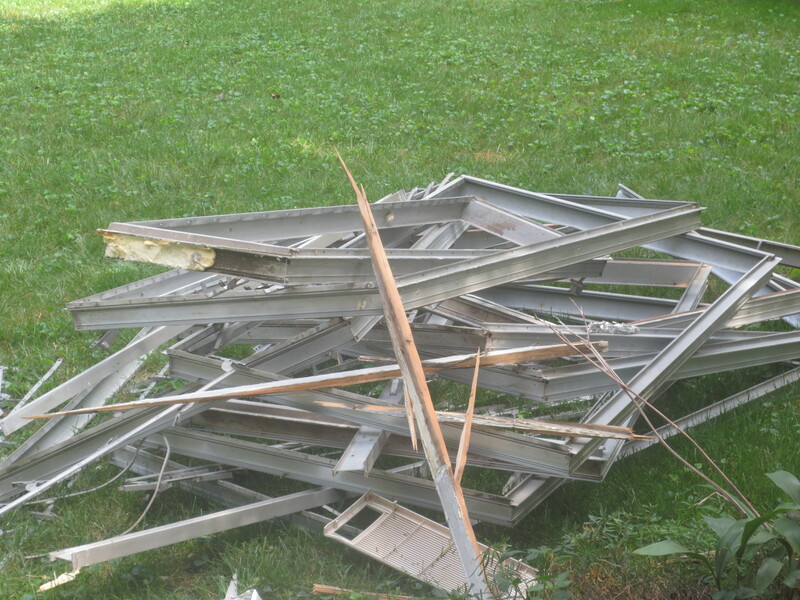 We were sad that they couldn’t be recycled as is, but we were able to take the frames to the scrap/recycling yard and collect $30 bucks. 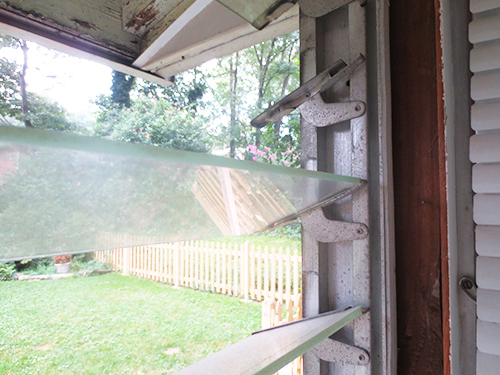 We are still thinking of creative ways we could use some of the old glass panes, so we are holding onto those for now. After the old window panes and frames were removed, the space felt so open and airy. Since it has been an unusually pleasant summer here in the mid-atlantic, it felt nice to have the room open like a porch, but we knew come January that we would be grateful for the insulation the windows provide. So we forged ahead. Last weekend Mark’s brother Matt came over both Saturday and Sunday to help with the work. Mark was still really grateful to have him there. As identical twins, they tend to think alike and Mark appreciated being able to run plans and ideas by his brother. They started setting the windows on the side of the room opposite where the old kitchen was. That wall would have two windows that flank a door. 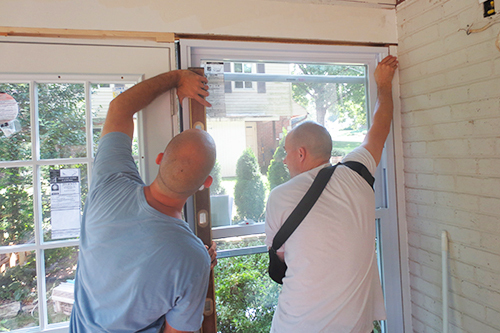 Originally, we weren’t planning to replace the doors at the same time we replaced the windows just as cost saving thing, but that plan changed when the boys suddenly realized that the doors didn’t actually have frames, they were just attached to the window frames. Cue the sad trombone. So off the Home Depot the boys went to get some exterior doors. The door from the kitchen to the sun room has windows in the top section, so that was the style we were looking for. These guys fit the bill for about $200 each. 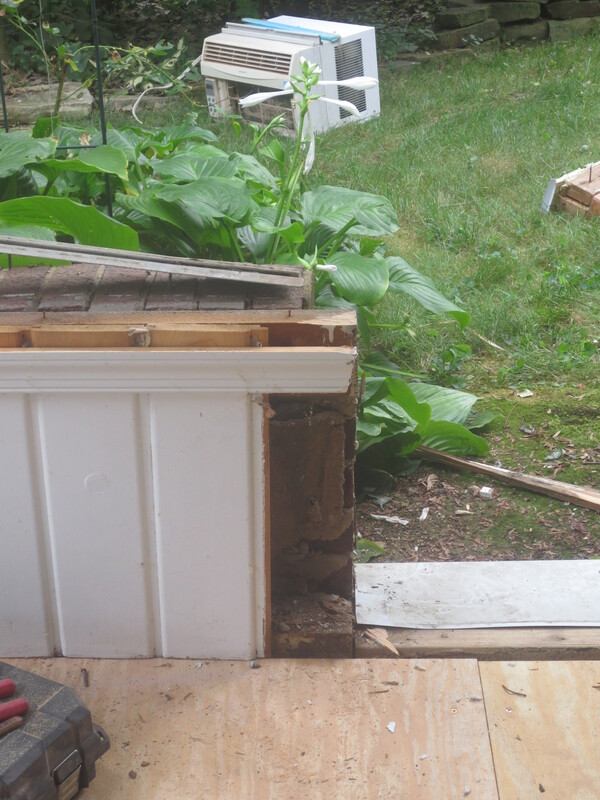 Before they could install the new door, they needed to remove the bulkhead that had been built down to accommodate the old door. Now that whole wall was completely wide open. 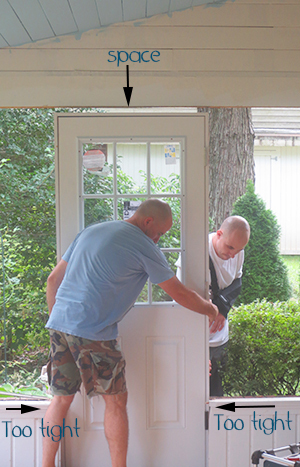 But the new door was a little too wide for the opening, so the boys had to remove a piece of bead board from each side. Then they put the door in place and built a new bulkhead for the top. After the door was set, it was time for the windows. What I learned from watching is that getting them set level is really important. You can’t just set them on the top of the wall and screw them in. I know a lot of people know this, but it was somewhat news to me. Mostly, I had just never thought about it before. The boys took a long time with each window to make sure they were setting it level. They used wood shims and of course, a level (it actually took two!) to make sure they had everything the way they wanted it before screwing into the posts. Here’s what that wall looked like when it was done. They continued this precise method of leveling with shims around the room until we had this. Isn’t it glorious? I’m in love. Although the windows are installed, we’re not quite done with the part of the project. We need to insulate around each window and door before adding trim pieces to get rid of all the gaps. I’m not sure how much work we’ll be getting done this weekend, but it would probably be good to get all the windows sealed before we get a big storm so hopefully we will at least work towards that goal. 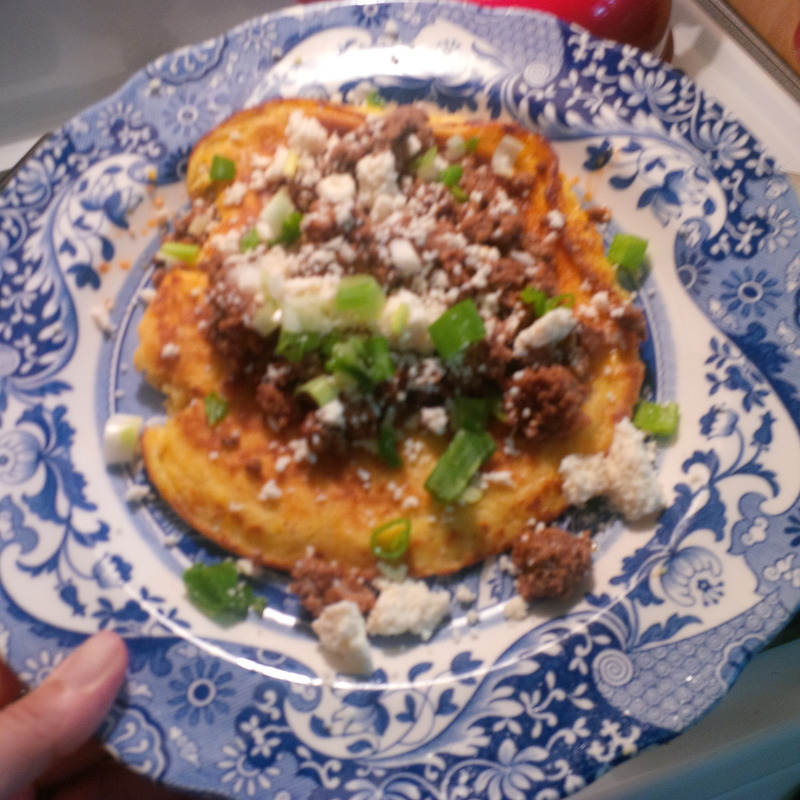 Just stopping by to tell you quickly about a yummy brunch item I cooked up over the weekend. It was tasty and just what the day laborers Mark and his brother Matt needed to get through the rest of the window installation. Which, by the way is done. I will be back tomorrow to share the gory details along with the glorious before and afters. Until then, think about the above option when you contemplate how to make the most of this year’s bumper drop of corn. 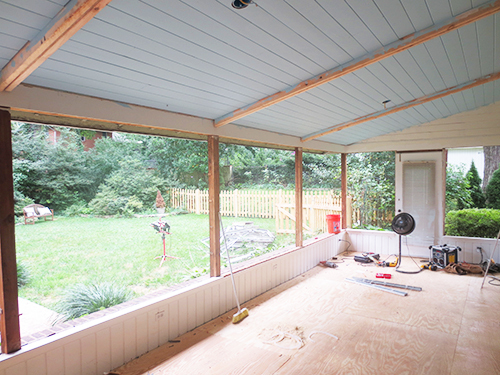 Today we’re back to sun room updates. When last we left off we were here. 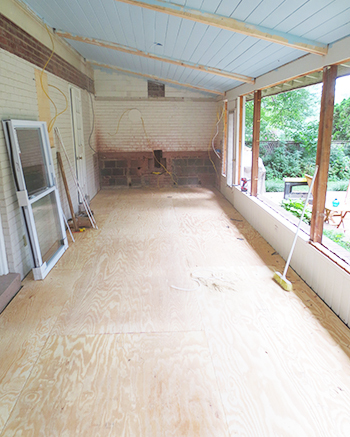 With the concrete removed, we were ready to add the floor joists to that empty area and then put down the sub floor. This meant first adding a band of 2×6 around the walls. 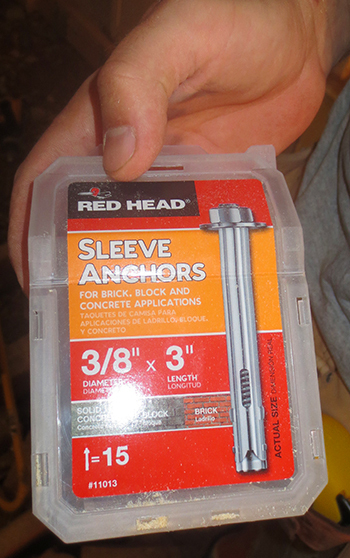 To do this, Mark used these sleeve anchors. That are made specifically for brick and concrete. These guys act similar to drywall anchors in that when they are driven into the wall they spring out and latch into the brick. 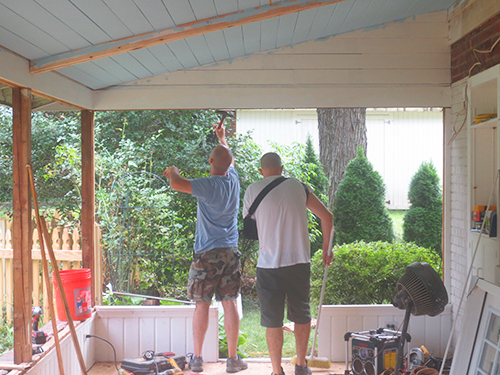 Once the band was installed, it was time to add the floor joists. These guys get screwed into the 2×6’s to hold the joists. I wasn’t around for the next step, so there are no photos, but the floor joist gets set down inside these brackets and screwed in. 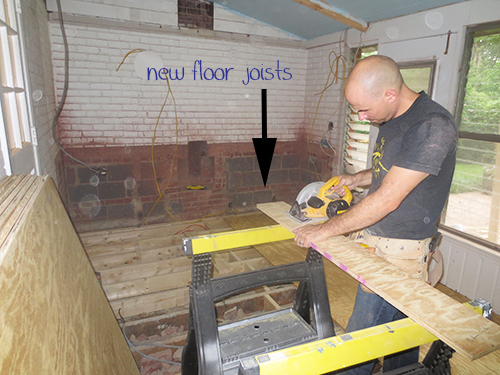 This next picture is more of Mark cutting the sub floor, but you can see the new floor joists in the background. So now that the floor joists run the length of the room, it was finally time to lay sub floor. I was up the street canning with Natalie and Julia on Saturday when this was going down (pun intended), so I left the camera with Mark and his brother. They weren’t the best at taking pictures, so I only have a few, but they report that it went down without a hitch and it seems as though they are telling the truth because it feels super firm and supportive underfoot. To install the sub floor the boys first measured the room. 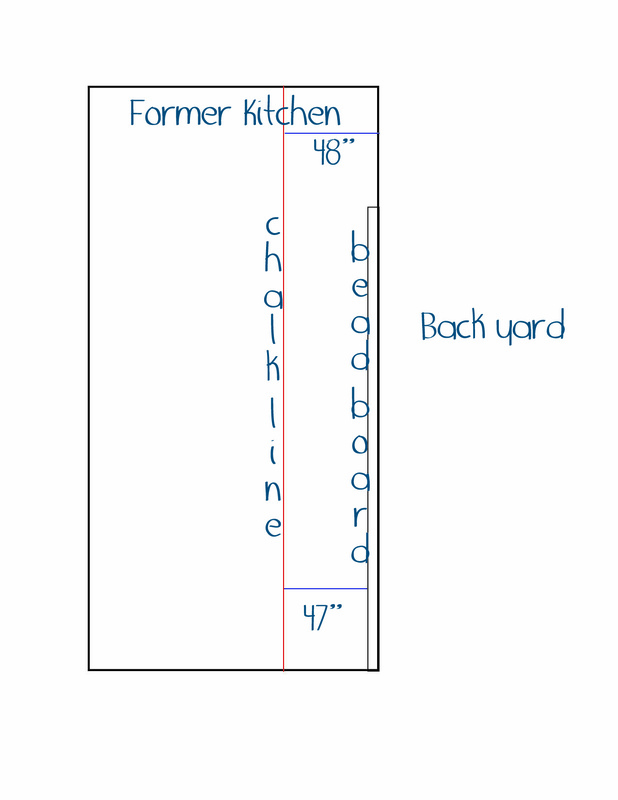 The part where the kitchen used to be was about an inch wider than the rest of it because it didn’t have the bead board around the bottom like the rest of the room did. 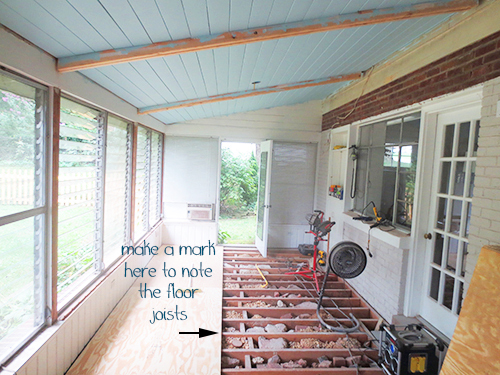 The sub floor boards are 48″ wide. 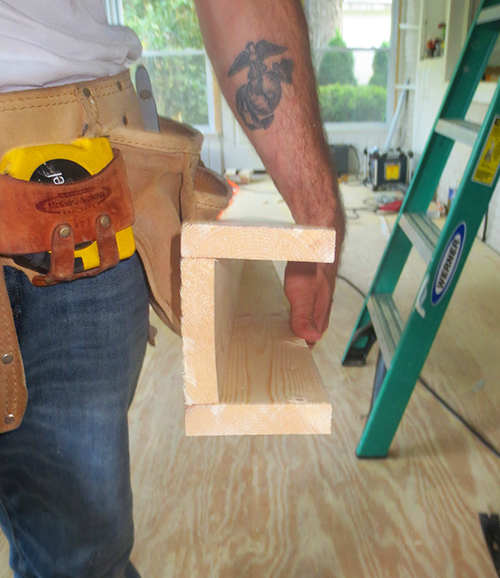 So they measured in 48″ from the exterior wall where the kitchen used to be and made a mark on the floor joist. 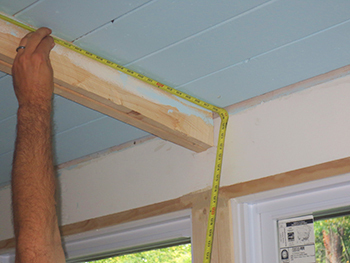 Then they measured 47″ from the exterior wall where the bead board is to account for the 1″ reduction in width. Then they ran a chalk line across to create a straight line to work off of. It’s important to work off of a measured straight line and not a wall or a corner because those are not always plum. Here’s diagram to show what they did. 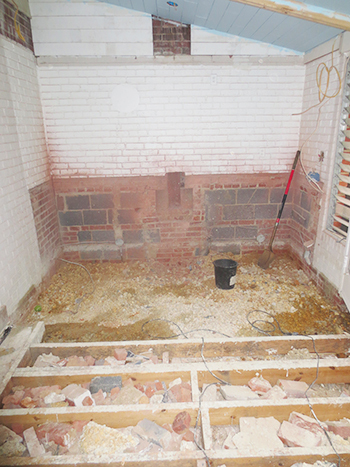 They started on the opposite side of the room from the former kitchen along the exterior wall. 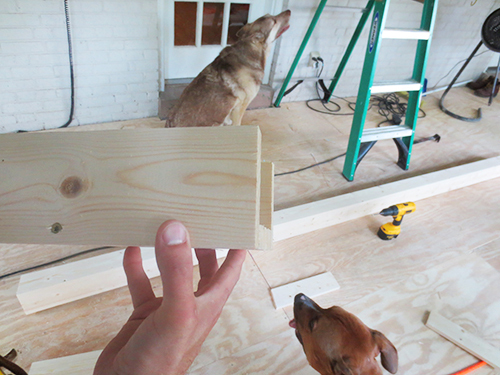 They cut off 1″ from these sub floor boards to account for the bead board along this section of the wall. 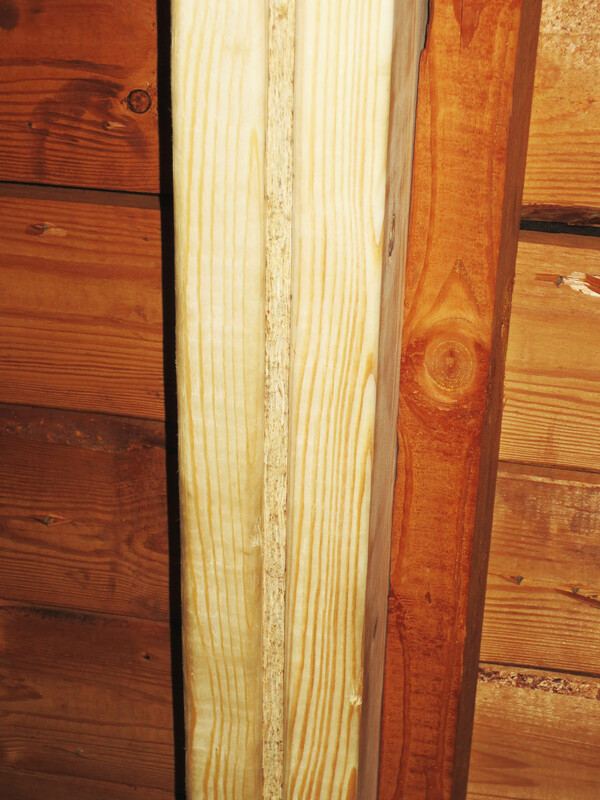 To install the boards, they put sub floor glue on each floor joist and then carefully laid each board in place before screwing it down with sub floor screws in each corner and a few in the middle, about 10 screws per board. 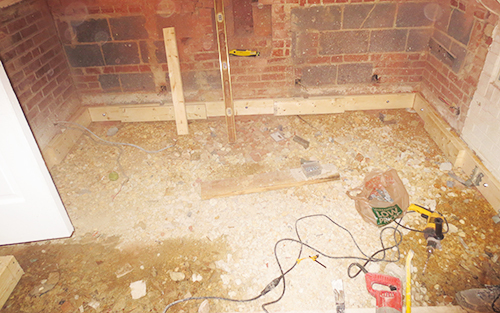 Once the first row was installed, they marked on the sub floor where the floor joists were so that they can screw the second row of board into them. For the second row of board, they cut the first board in half length-wise so that the seams would be offset from the first row. They didn’t need to measure again because they knew that they first row is plum, so the just locked in the next set of boards. For the third row, they kept board’s length in tact to match the first row, but had to cut the width down to only about 2′ since that’s all the width left in the room. They also had to cut in around the steps into the house. Here’s how it looked after it had all been laid. 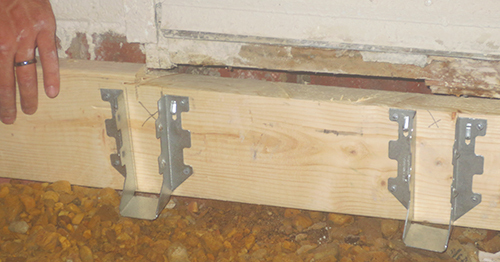 Since Mark had marked on the sub floor board where the floor joists were beneath it, he was able to go back once it was all laid and add one additional screw every one foot of floor joist to give the floor further reinforcement. This added about 45 screws to every sheet of sub floor. Reinforcement indeed. So that’s the deal on the sub floor. We can’t wait to sand and paint it, but before we do that, we’re going to install the windows. As you can see in the picture above, we’ve already started, and having those old jalousie windows out of there is amazing. 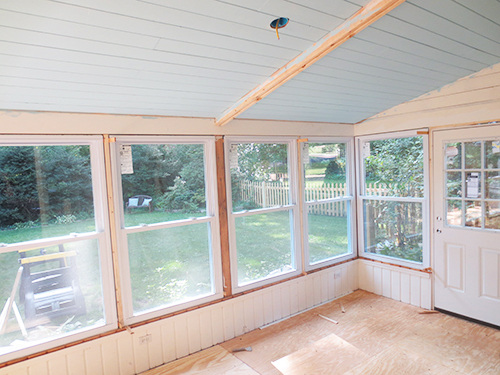 I will be back later this week with a whole post about installing the windows and the doors. You guys, it’s starting to come together!